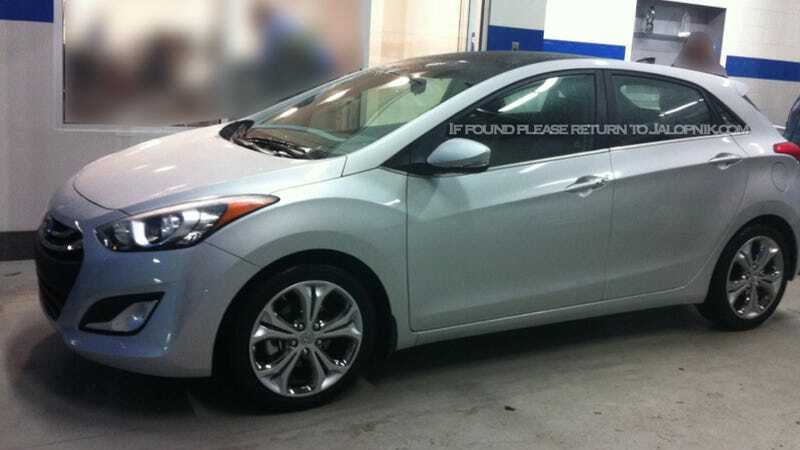 Small-hatch fans take note: An anonymous tipster has forwarded photos of Hyundai's upcoming Elantra hatchback to Jalopnik. The compact five-door was caught in the open wearing Michigan manufacturer's plates and not one bit of preproduction camouflage. What appears to be a production-ready model is nearly identical to what is called the i30 in the rest of the world. Whether or not the Touring will carry over the same powertrain used in the Elantra/Sonata or, maybe, add a higher performance turbo option remains to be seen. Were certainly in the pro camp when it comes to more powerful hatches. We're guessing the car will retain the Touring name used on the prior five-door Elantra Touring and that it'll be introduced at next month's Chicago Auto Show alongside the coupe version that's also been spotted, if only because Hyundai rumors tend to be mostly sort of boring and plausible like this one. What we're really hoping for, of course, is for the Hyundai i40 - i.e. the Hyundai Sonata Wagon — to show up randomly at an auto show.